Dr. Mike Paul cautions against using information obtained on the internet as a substitute for good veterinary care. These days, most of us enjoy communicating with one another on the internet. Just a few days ago my internet provider went on a walkabout and for nearly 3 days I was without web access or email. A few times, I wondered aloud: "How did the world survive without access to on demand information and communications? How did we ask and answer questions? How did we share knowledge?” Fortunately, we as veterinarians and you as pet owners don’t often have to do without some form of connectivity. That is wonderful, but it's not without a downside. A search of Google for “Pet Health” turned up nearly 350 million hits in just 2.5 seconds. Now I don’t want to propose that all of these mentions should be vetted for relevance or accuracy, but you should always remember that relatively few of them are. There is a vast amount of information on all things pets. Much of which has been developed by organizations that are experts in every area of veterinary medicine imaginable, or are manufacturers of pharmaceuticals and products that have been thoroughly evaluated and approved, or are even veterinary teaching hospitals and veterinarians who have demonstrated and proven expertise in areas of medicine. Unfortunately, many online sources have not been vetted at all. Remember, the internet gives people a blank page to bring you their perspective often with little more than opinion to support what they say. So how do you pick a resource for information? Where can you go to be sure you come away with accurate and useful information? How do you decide which sites to follow and listen to? First, find a veterinarian you can trust and communicate with. Veterinarians know you go to the web. They go to the web too! But NEVER let the internet be a substitute for a visit to the veterinarian. They are your trusted advisors and they are committed to providing the best care and advice they can. So before you do anything else, ask your veterinarian for help. 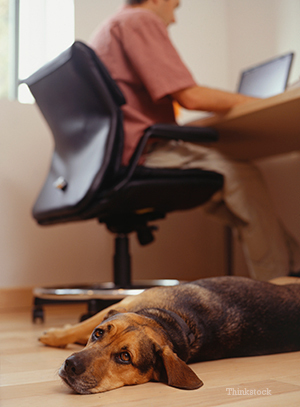 We know that 40% of people who go to the veterinarian have gone online before even calling. Fortunately, many pet owners have used the web as a source of information but not as a substitute for veterinary care; although, 25% of them go back online to make sure what they were told makes sense. Second, and related to the first point, remember that the web can be a great complement (but never a substitute) for veterinary care because it can help you to gather information, prioritize concerns and verify your understanding. I wish more pet owners would do this. Being armed with knowledge and accurate information makes for better experiences, better outcomes, and most importantly: higher levels of pet owner satisfaction. So always remember much of the web and most of its content has not been well vetted and confirmed. Anyone can express their ideas on the web. There is great information but there is also an ocean of inaccuracy and concern. When in doubt, visit websites developed by professional associations and organizations. As a rule, they have been well founded, and are reviewed and amended regularly so you can be confident that the information you get is accurate. If you read something on a site, especially a site whose authors are not skilled in animal medicine, please look further. Check what was said by going to a reputable site. When you have a concern about your pet’s health or recognize an abnormality in their behavior always seek the advice of your veterinarian. Only a veterinarian is trained to evaluate your observations, conduct a thorough physical examination, interpret diagnostic tests and advocate for the best recommendations. So while consulting the internet is fine be sure that your veterinarian is always involved and consulted. He or she is the ultimate expert on your pet’s health.